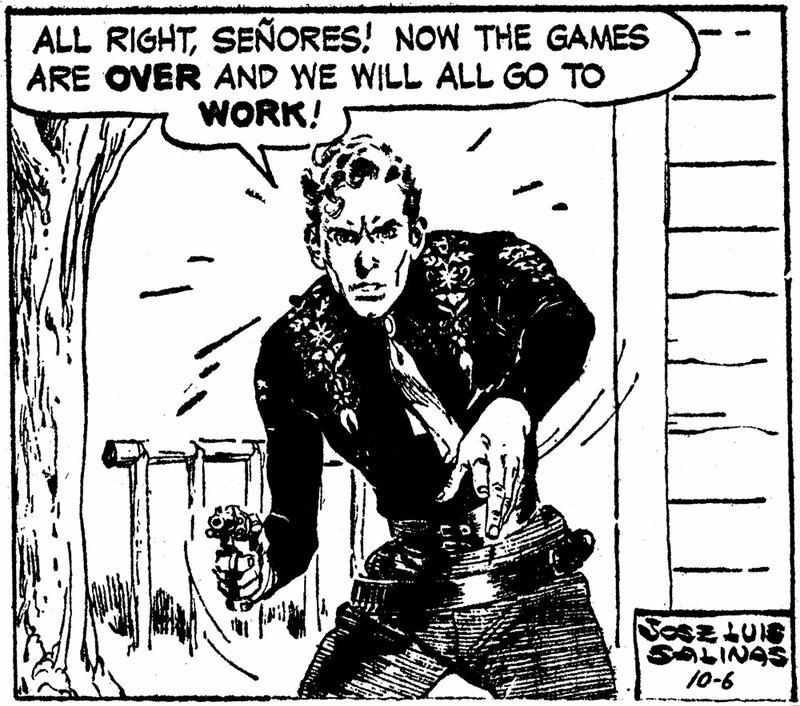 In a couple of weeks I'll have the first pass done on the scanning of Cisco Kid, volumes 1 and 2, at that time I will be posting a list of dailies that I am looking to replace. I'm going to replace as many of the strips as I can in volume 1 to use the 'uncut' versions - this material is now being sent to me from Europe and I should be able to keep the pub date of 7/31/2010. More later. The Cisco panel above comes from 10/6/1953. Hi, I will be posting a lot of realistic comic strip ads on my blog this week, comparing styles. One set of them is Sam Spade, which has always been attributed to Lou Fine. Another set is Philip Morris, which to my eyes is very similar to the Sam Spade ads and the film ads I have shown earlier. Thirdly I have the 1954 GM Rack comic book Steel!, which also is in a similar style. But since it's from 1954 and produced, I can't really be by Fine. I would so much like for Leonard Starr to give his opinion. Can you arragnge such a thing? I've told my grandkids that if I didn't have the funnies, and funny books, I would never have learned to read. I watched The Cisco Kid in the movies, on TV and in funny books. His horse, Diablo, was one of my favorites. I think he was an Andelusian cross. All the funnies ever made should be run again. The art, and the stories, would do young people nowadays a world of good. 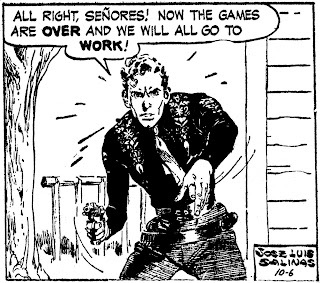 We are eagerly waiting for Cisco Kid Volume 1. May I know, when can we expect it? I'm working on it and have finished the first pass on volume 1 - now I have to go back and clean up as well as try to find some replacements if possible. I figure the book will be out sometime this summer leaning more towards fall. I've pretty much got a complete run of the strip and plan to publish 2 volumes a year starting in 2012 - for a total of 8 volumes.